Exit at PISA AEREOPORTO. Proceed along the motorway FI. PI. LI. Towards Florence (Firenze). Exit at PONTEDERA – PONSACCO and follow the direction signs to VOLTERRA for about 20 km. Pass the hotel/restaurant Molino d’Era, then after crossing a small bridge, immediately turn right. Proceed along STR. 439 and follow direction signs to COLLE VAL D’ELSA – SIENA – RONCOLLA. Do not follow direction signs to Volterra. Once you reach the fork, take the S.R. 68 towards Colle Val D’Elsa; you will find direction signs to Mazzolla after about 2 km. After about 3 km, before entering Mazzolla, on your left you will find direction signs to Podere Barbaiano, which you will reach after 5 km of a panoramic, firm dirt road. There will be more signs indicating Podere Barbaiano throughout these last 5 km. Exit at VAL DI CHIANA and follow the direction sign to SIENA, then look for SUPERSTRADA SIENA –FIRENZE. Take it toward Firenze . Exit at COLLE VAL D’ELSA. Follow the direction signs to Volterra up to the village Castel San Gimignano. Proceed for 7 Km, then turn left at the direction sign to Mazzolla. In about 3 kms before you reach the small village , turn left following the direction sign to Agriturismo Podere Barbaiano. You will be there after 5 Km of a scenic firm dirt road. In the meanwhile you will find further direction sign to Podere Barbaiano. FROM THE NORD - Highway A1 from Milano to Firenze. Exit at FIRENZE-IMPRUNETA. Take the freeway Firenze-Siena and exit at COLLE VAL D’ELSA. Once you have passed through, proceed for about 20 Km on SR 68 following direction to VOLTERRA . Past the small village of Castel San Gimignano. proceed for 7 Km, then turn left at the fork where you will find the sign to MAZZOLLA. 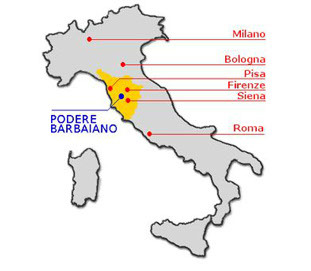 Drive for 3 km, then before entering Mazzolla turn left at the sign Agriturismo Podere Barbaiano. You will reach it after about 5 Km of a scenic firm dirt road. There will be more signs indicating Podere Barbaiano throughout these last 5 Km. FIRENZE: to 70 km. In the middle age Firenze was at the center of many trading, financial, economic and cultural interests. 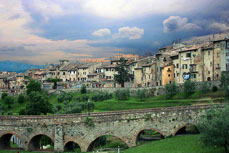 During the ”modern age” it was the main town of Granducato di Toscana, under the leadership of two important families such as the Medici and the Lorena. It has been the capital of Italy in the period between 1865 and 1871, just after the unification of the Country. It is still a very important academic center ,and the town has been declared World heritage from UNESCO. It is considered the renaissance place of origin, and it is recognized as one of the most beautiful town of the world for its architecture, the amazing number of monuments and its world known museums, such as the Duomo, Santa Croce, The Uffizi, Ponte Vecchio, Piazza della Signoria and Palazzo Pitti. PISA: to 60 km. 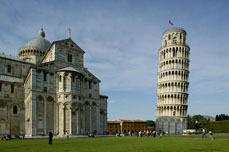 Pisa gives its visitors the enjoyable experience of a town which can still be lived at slow pace. Take your time walking around; mix with the many students, gathering on the river borders. Pisa is one of the ancient Repubbliche marinare. It developed on banks of the river Arno. The ever-changing riverside background ,with all its curves and historical buildings, can be enjoyed from the five bridges which cross the river in the downtown area. Pisa offers much more than the famous leaning tower (Torre Pendente) and it deserves long enough stay to allow the visitor to discover the many suggestive and beautiful corners, the small squares, the ancient middle age churches, just walking through its historical center. SIENA: to 50 km. The town of Siena is known throughout the world for its historic monuments and buildings, and for its peculiar mediaeval urban structure. It is one of the most important gothic towns. In 1995 UNESCO has recognized its historic downtown as humanity patrimony. None among other middle age towns, has been so clever in the maintenance of its cultural and historical heritage as Siena, with its famous Palio and the 17 Contrade, with its art masterpieces, and the historical downtown which appears an open museum. Every year the town of Siena organizes about 600 high quality events, which include summer music entertainments and numerous art expos. Siena is worthwhile visiting also for handcrafts, food and wines which reach a very high quality and reflect the local culture and tradition. 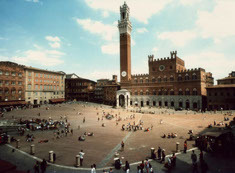 Siena gives its guests rich emotional and unforgettable experiences. VOLTERRA: to 12 km. Volterra and its suggestive surroundings probably offers one of the most diverse variety of attractions in Tuscany. Historical traditions here are associated with a stunning nature. The landscape, flora and wildlife is truly impressive. Volterra has still a conspicuous historical heritage , from the Etruscans till the end of 19th century. Beautiful monuments and traces of each peculiar period can be appreciated just walking through the small streets of the town historical center, or visiting its museums. Besides, the nature is still uncontaminated, the quality of life is ideal for mankind and you can find here a unique artistic handcraft: the alabaster sculptures. SAN GIMIGNANO: to 23 km. 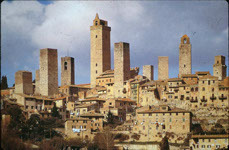 San Gimignano is located in the heart of Tuscany, in Siena’s area. It is known all around the world for its medieval towers that rise over the town. For this reason it gained the nickname of Middle age Manhattan. Of its 72 original towers, built during the golden historical period of The Comuni, 16 are still standing. Set in the middle of a countryside among the most beautiful of Italy, between Florence and Siena, his territory is rich with ancient culture and traditions. From 2005 the cultivation of saffron, which has been recently restored, has obtained the certification of D.O.P (Protected Origin Denomination). COLLE VAL D'ELSA: to 23 km. Colle Val d’Elsa is set within Florence, Siena and Volterra territory, in a strategic position,on the main road which in the middle age was used by travellers from north Europe to Rome. The town developed from three different small villages: Santa Caterina , Castel Piticciano and Il Piano. Nowadays the town is still strongly characterized by a middle age architectural structure. Therefore it can be considered as an open air museum. Colle Val d’Elsa is also famous for its crystal glass manufactures ; in fact it has been known as “citta` del cristallo” (city of crystal) since 1800s. Nowadays it covers 15% of the world crystal production, and over 95% of the Italian one. Cecina, to 60 km, it is the natural access to the seaside from Volterra and Siena. From here the tirrenic coast begins. Monteriggioni, to 35 km, medieval village, the solid walls still characterizes the geometry of the settlement. Bolgheri, to 50 km, the tall cypresses sung by Carducci outline of the long avenue that takes you to this picturesque village.